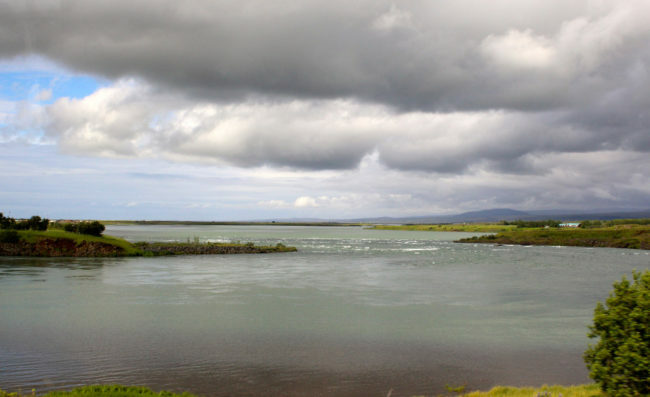 Iceland is a young country in geological terms, only 20 million years old. The land is constantly changing. Volcano eruptions create lava fields. Bays and fjords fill up with ash. 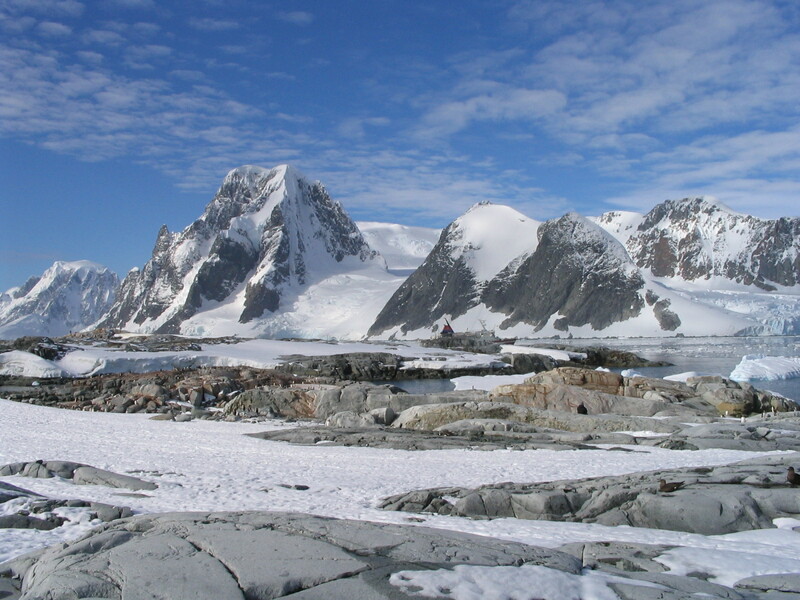 Islands are joined to the mainland and become mountains. Glaciers melt into rivers. To really appreciate this though, you need to get out into the countryside. During my four-day stopover in Iceland, I based myself in Reykjavic and decided that my budget allowed exactly one day trip out of the city. My first reflex was to book myself on a Golden Circle tour, the most popular excursion, but then I paused. 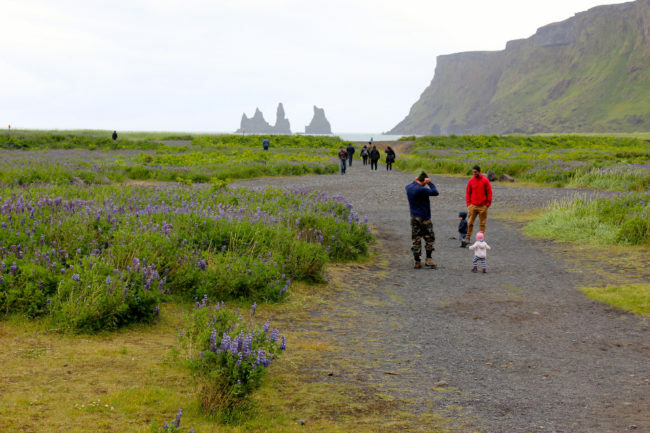 I’m sure the Gullfoss waterfall, the Thingvellir National Park, and the Geysir hot spring are spectacular sights, but did I really want to share them with hundreds of visitors and dozens of tour buses? Well, no. 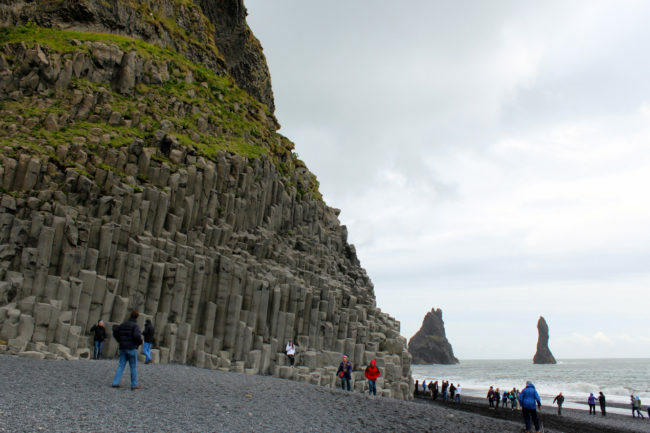 A second option, that looked just as appealing (more actually) was a South Coast tour: two waterfalls, a black sand beach with basalt columns and a glacier at close range. Short of sighting a volcanic eruption, this sounded like a good cross section of the geological features and landscapes that Iceland is famous for. Here is a photo-account of my South Coast of Iceland day trip. Heading southeast on Highway 1 (the Ring Road) out of Reykjavik, we first traverse a lava field. For nearly 50 kilometres, all we see is a lumpy field of dark volcanic rocks covered in bright green moss. Then the landscape changes. Villages and rivers start appearing, as well as “mountains” of volcanic origin. They remind me a bit of Kauai in Hawaii. We make a brief photo stop in front of a farm. Located right below the Eyjafjallajökull volcano that erupted in the spring of 2010, it now has a visitor centre that gives information about the event. Eyjafjallajökull (meaning “island mountain glacier” in Icelandic) is a volcano located below a glacier, which explains why it produced so much steam. 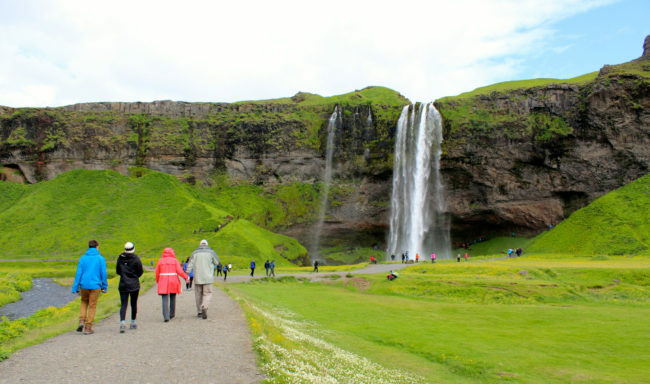 The first waterfall we visit is Skógafoss. 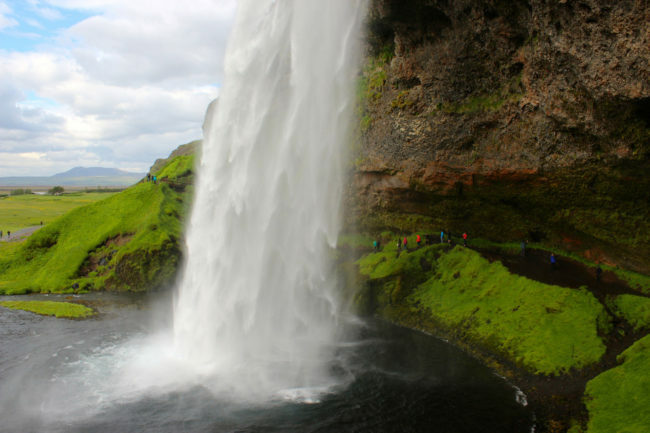 One of the biggest and most splendid waterfall in the country, Skógafoss tumbles down from a height of 60 metres. It’s cloudy during our visit, so we can’t see the rainbow that normally appears through the spray on sunny days. To the right of the waterfall, a staircase climbs to the top of the cliffs, where a hiking trail begins. The view of the fall from up there is nothing special though, and it’s a lot more spectacular from the bottom. Good exercise though. 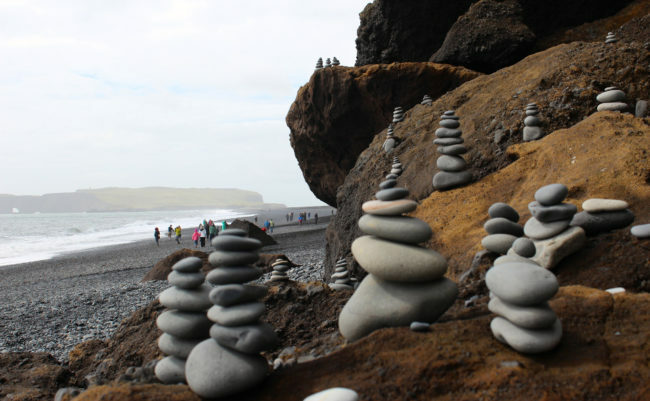 We make our way to the village of Vik (pop: 300) on the southern shore for lunch. The restaurant/convenient store/gas station is nothing special, but the landscape behind it is pretty amazing. 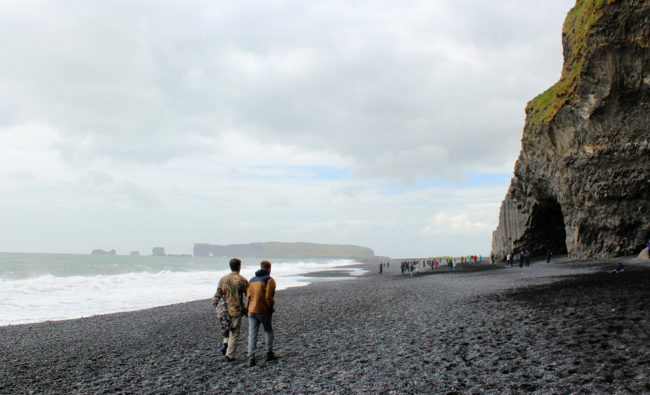 Reynisfjara is a black sand beach featuring basaltic rock pillars and some rocky stacks in the distance. We are warned to stay well away from the surf, as visitors regularly get soaked to the knees. Further down the beach you can get a better view of the stacks. There are also some puffins who nest here in summer. We see a couple way up on the rocks, but would need binoculars to distinguish their features. I really want to see puffins close up! Looking at the beach in the opposite direction. There seems to be a cave in the rock on the right, but it’s actually just an alcove. We’re obviously not the first visitors here. Some people have left these interesting sculptures. Look how smooth and rounded those stones are. It goes to show how powerful the sea is around here. At our next stop we take a short walk to the Sólheimajökull glacier, one of the outlet tongues of the Myrdalsjökull ice cap. It’s early summer, and the ice is melting rapidly, forming a mini-lake in front of the glacier. 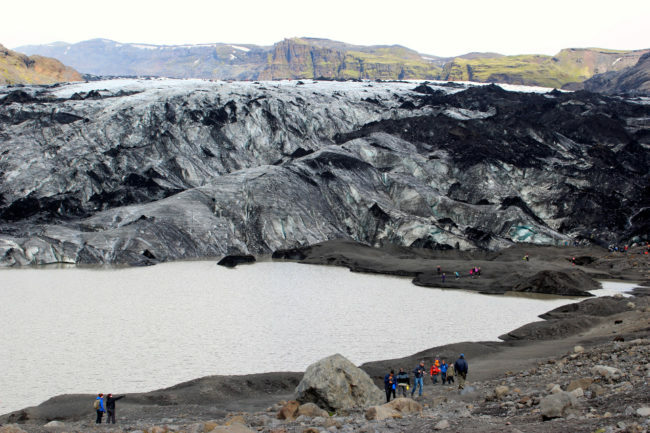 What looks like dirt on the ice is actually volcanic ash. Since we have a guide, we are allowed to walk past the warning sign all the way to the face of the glacier. 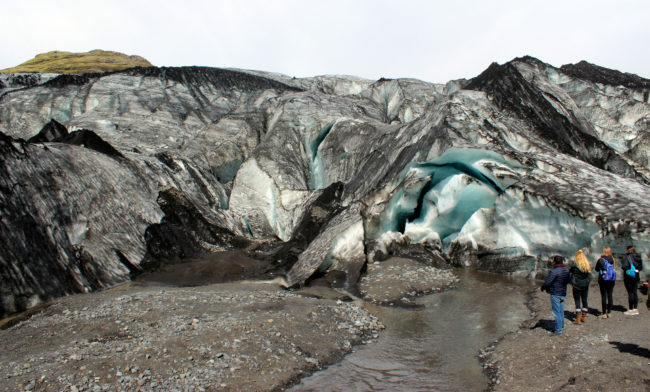 Where pieces have fallen off, we can see the blueish colour of the ice, which is due to the fact that glacial ice is much denser than regular ice (different structure). We walk right up to the ice and touch it! This is my first time actually “touching” a glacier. I can see trickles of water running off it. 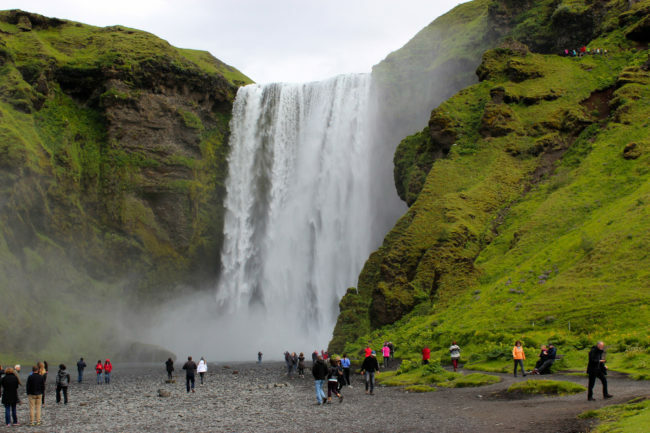 Our last scheduled stop is the Seljalandsfoss waterfall, just over 60 metres tall, and one of the most popular in Iceland. The grass around it is speckled with white, yellow and purple wildflowers. 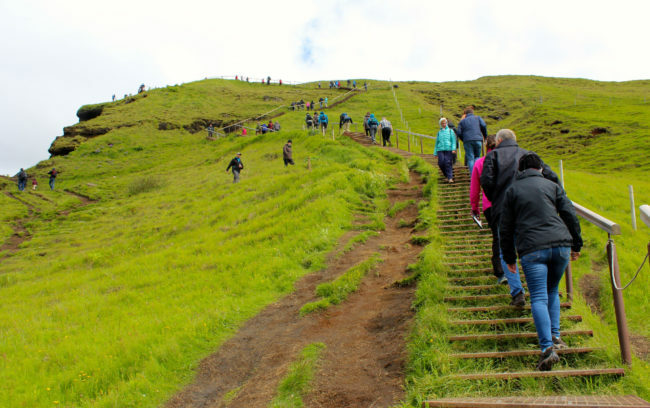 An interesting feature of Seljalandsfoss is that you can walk behind it. It gets very wet, so a raincoat is handy. On the way back toward Reykjavic, we make an impromptu stop by the side of the road at the request of some passengers. They’ve just spotted some cute Icelandic horses. These small horses are very friendly: as soon as we approach, they come to see us! 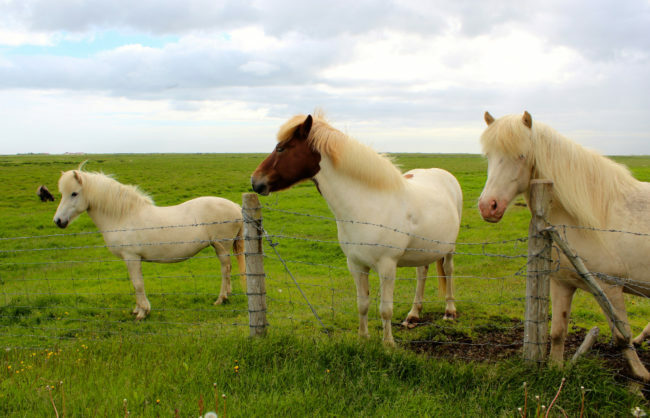 Icelandic horses are the only breed allowed on the island, which counts 100,000 of them (for 330,000 inhabitants). The company I toured with is called GeoIceland. I chose them because they had the best rating and reviews on TripAdvisor. I wasn’t disappointed. They picked me up at my accommodation at the scheduled time to join a small group of only 18 people. Our guide, Oscar, was friendly, knowledgeable, and accommodating. If you have a rental car, you should be able to do this tour easily on your own. 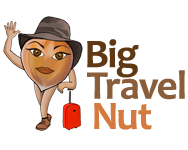 All the attractions are located along the ring road, so you do not require a four-wheel drive vehicle. 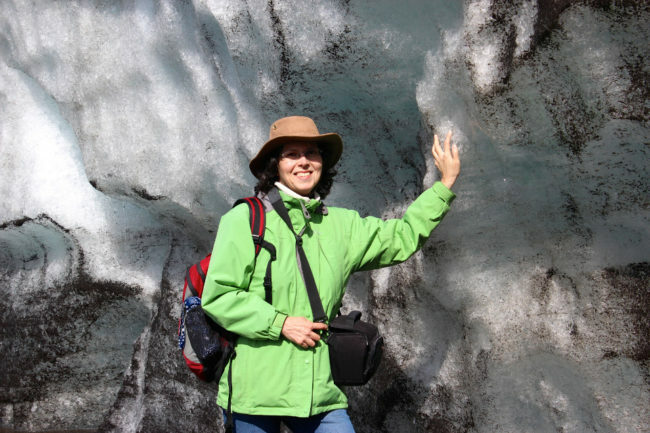 Without a guide, you won’t be able to walk right up and touch the glacier though! 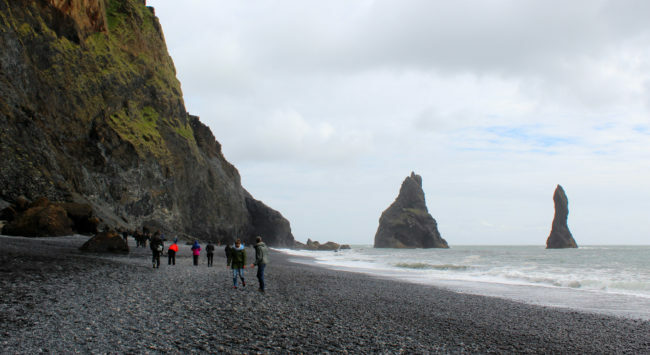 Note: GeoIceland did not sponsor my tour as they’re a very small company, but they gave me 10% off upon hearing that I was a travel blogger planning to write about the trip. The full cost of the tour is 13,900 ISK (US$117) and they’ll give you a 10% discount if you book three tours with them.